The term "Phantom Island" conjures up images of a small island in the middle of some vast ocean, a thick layer of fog enshrouding all but its jagged peaks that claw at the sky. Something found in the pages of a fantasy novel or a funky comic strip. Interestingly, the term "Phantom Island" has a real world application. This is the name given to an island on a map that, one way or another, has been to proven to be non-existent.. This non-existent - or "phantom" - island is subsequently removed from all relevant maps. This scenario generally occurred when early sailors, exploring unknown regions, got their bearings wrong and misidentified what they were seeing. For instance, the Baja Peninsula in California was at one point represented as an island off mainland America. There have been other instances in which purely mythical islands have been added to maps. The Isle of Demons was purportedly an island off the coast of Canada. It first appeared on a Johannes Ruysch map, dated 1508. Legend had it that the island was inhabited by vile demons and crazy hell beasts that attacked passing ships or those foolish enough to land on its demented shores. Sounds very much like the fantasy novel images I mentioned earlier, doesn't it? 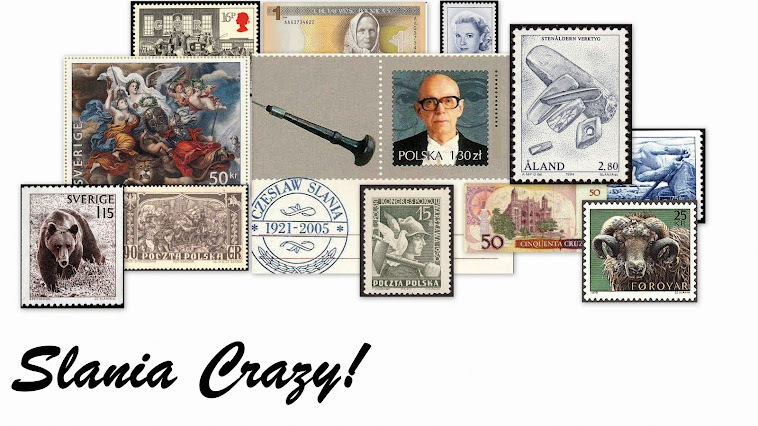 So what exactly does all this have to do with stamps? Well, several weeks ago I wrote a blog on the 1984 Nordia Exhibition mini-sheet, designed and engraved by Czeslaw Slania. Click HERE to have a look. 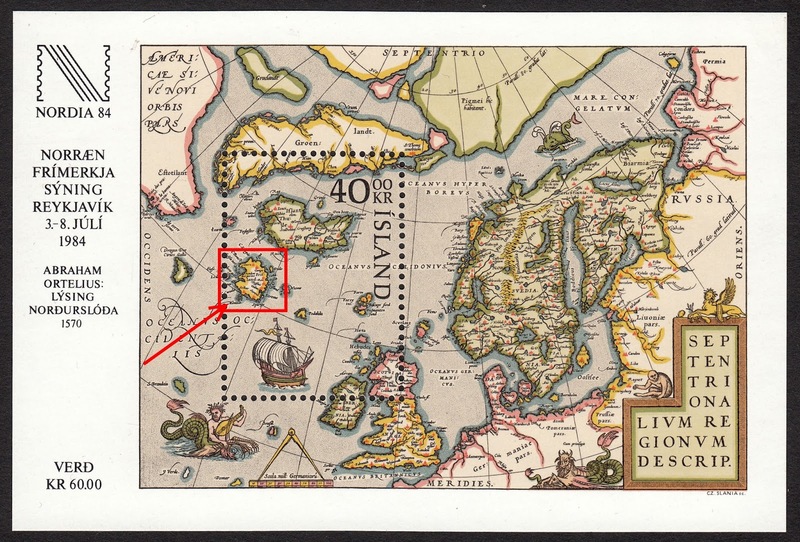 After I had published the blog, it was brought to my attention by a stamp buddy that the map featured on the mini-sheet actually contains a Phantom Island. Pretty cool! 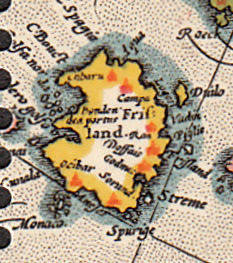 The Phantom Island in this map was known as Frisland. It apparently appeared on most maps of the North Atlantic for roughly one hundred years beginning in the 1560's. So where is Frisland on the 1984 mini-sheet? 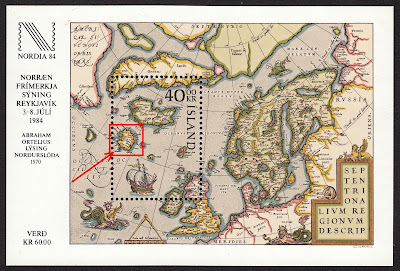 Our Phantom Island can be located on the stamp portion of the mini-sheet at centre-left, adjacent to the perforations. See below. You will note that many of the discernible names have an Italian flavour to them: Aqua, Spagia, Bondendea, Monaco. This strongly suggests the original reports of this island came from southern Europe somewhere. If you'd like to learn a little more about Frisland click HERE. I Muse... On Our 2nd Birthday!